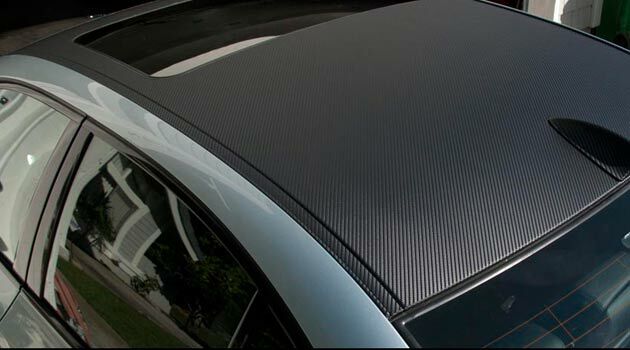 Carbon Fiber Vinyl Film is a 3D Signature Series Black Carbon Fiber Vinyl. This is our newest and most popular carbon fiber vinyl to date! Unlike other ordinary carbon fiber vinyl’s our Carbon Fiber Vinyl is manufactured to a level of outdoor durability and UV resistance unmatched by others. With a thicker surface, deeper 3D weave, bi-directional air-flow channels and no need for lamination, our Carbon Fiber Vinyl is the smart choice for any application. Bi-Directional Air Release Channels – Trapped air easily releases via the CFV Bi-Directional Air Release Channels. True 3D Texture Weave Feel – Almost impossible to distinguish from real carbon fiber, the 3D weave is built into the layers of vinyl that truly feels real to the touch. Extreme flexibility resulting in risk free applications. Use heat from gun or household hairdryer to stretch and make more pliable around tough curves. Completely waterproof vinyl, use in any outdoor conditions (even saltwater tested!) Plus our CFV will not fade or discolor outdoors even in the most harsh sun conditions.